Bauxite Ore, Natural Indian Minerals, Hematite : Fe2O3, Magnetite : Fe3O4, primarily used in iron and steel industries for manufacturing of pig iron, sponge iron, steel ingots, in cement, ferro-alloy, pigments etc. Physical Properties - Bauxite ore is world primary source of aluminium. Bauxite does not have a specific composition. It is a mixture of hydrous aluminum oxides, aluminum hydroxides, clay minerals, and insoluble materials such as quartz, hematite, magnetite, siderite, and goethite. The aluminum minerals in bauxite can include: gibbsite Al(OH)3, boehmite AlO(OH), and, diaspore, AlO(OH). Mode of Occurrence - Bauxite is not a mineral. It is a rock formed from a laterite soil that has been severely leached of silica and other soluble materials in a wet tropical or subtropical climate. It is the primary ore of aluminum. Almost all of the aluminum that has ever been produced has been extracted from bauxite. Uses - Bauxite is the principal ore of aluminum. The first step in producing aluminum is to crush the bauxite and purify it using the bayer process. In the bayer process, the bauxite is washed in a hot solution of sodium hydroxide, which leaches aluminum from the bauxite. 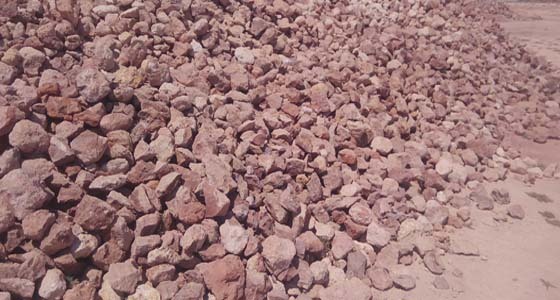 Sintered bauxite is used as an oil field proppant. In drilling for oil and natural gas, the reservoir rock is often fractured by pumping fluids into the well under very high pressures. Industrial Prospects – Molten aluminum is removed from the solution by electrolysis. This process uses an enormous amount of electricity. Aluminum is usually produced where electricity costs are very low.